Austin, Morris & Singer Cars garage in Bristol, 1931. Homepage. This page: Travel back to Bristol, 1931, and read of a Morris Minor being part-ex'd against a Singer motor-car. The Maple Leaf Garage of Clifton, Bristol. Evidently Mr C.E. Rowe, of 77 Cotham Brow, Cotham, was planning a change of car. 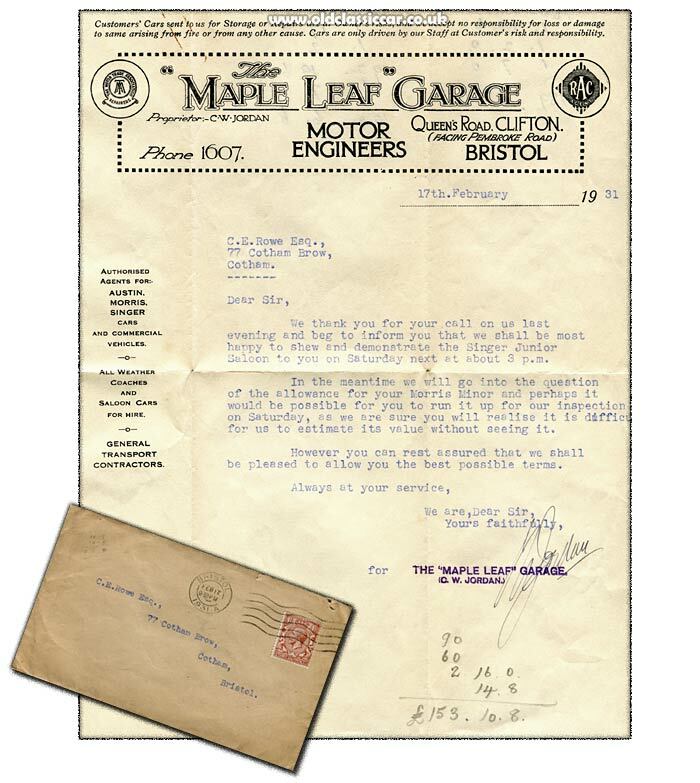 This letter from The Maple Leaf Garage, on 17th February 1931, refers to his interest in acquiring a Singer Junior saloon, to replace a Morris Minor that might well end up being traded in against the Singer. Possible location of the garage. The garage's location is given as Queen's Road, Clifton, in Bristol. Quite where on Queen's Road the garage was located isn't clear, a photo on Flickr (link) shows a single-deck coach belonging to the firm in 1933, so their premises - by 1933 at least - must have been reasonably large. An RAC Handbook from that era simply lists the road name also, without a specific number. The only other clue given is that it was "facing Pembroke Road". A look at the map shows the far end of Queen's Road facing over a roundabout to Pembroke Road, and this altered building may well have started out in life as a garage, the smaller addition on the left has the look of a small showroom about it. There have been planning applications in recent times to knock this building down and replace it with new flats. Part-exchange of a Morris Minor against a Singer. We thank you for your call on us last evening and beg to inform you that we shall be most happy to show and demonstrate the Singer Junior Saloon to you on Saturday next at about 3pm. In the meantime we will go into the question of the allowance for your Morris Minor and perhaps it would be possible for you to run it up for our inspection on Saturday, as we are sure you will realise it is difficult for us to estimate its value without seeing it. However you can rest assured that we shall be pleased to allow you the best possible terms. To see examples of the pre-war Morris Minor, of the type that Mr Rowe owned in February 1931 and I've had myself, please see the pre-war Minor page in the gallery section of this site. Examples of Singer Junior may be found here for comparison. Return to the Motoring Collectables section for more items like this.